This is not a true Spinach but the leaves resemble Spinach leaves and are produced in abundance on stems a foot or more in length. 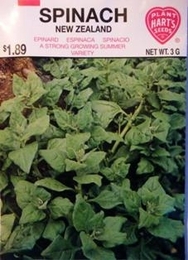 It will grow during hot weather when other Spinach will not produce. A short row in your garden will furnish nice ÔgreensÕ all summer. An Excellent mid-summer crop, the leaves can be cut frequently, as new leaves develop replacing the older lower leaves that are removed. 375 Seeds/oz. Plant 1oz per 100ft row. 15lbs of Spinach seed needed per acre. Average Spinach yield per acre -604 bushels.